I teach at Writtle School of Design. A couple of us inherited a course called Digital Art and Design. We told the students that henceforth digital, non-digital or hybrid activities were equally welcome and we introduced lots of drawing activities which eventually found their most powerful and distilled expression in a weekly, student led, staff and student drawing session every Monday morning. Ruth Catlow and I have written about this for TRACEY. 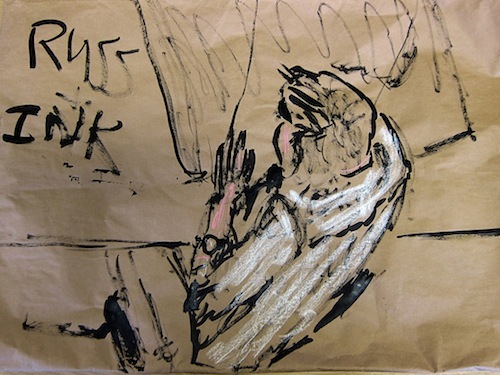 I made the image opposite in the studio at Writtle, messing around with brown paper, ink and pastel to make a portrait of a moving target, a student called Russ.